In 2007, the Israel Ministry of Foreign Affairs initiated a nation-branding campaign informally known as ‘Beyond the Conflict.’ The goal was to change people’s perception of Israel from a war zone populated by the ultra-religious into a more normal place – rich with culture, dominated by high-tech and scientific achievement and grounded in identifiable, Western values. American nonprofit organizations joined the effort by making sure non-conflict stories saw the light of day – everything from Israeli companies being listed on the NASDAQ and Israeli-made computer chips powering everyday products, to stories about Tel Aviv’s nightlife and Israeli model Bar Rafaeli gracing the cover of Sports Illustrated’s Swimsuit Issue. Nation-branding is practiced by many states, from established democracies like the U.S., Canada, France, Japan, South Korea, South Africa and New Zealand to developing countries like Tanzania, Colombia and Guatemala. It’s not unique to Israel. LGBTs enjoy these rights nowhere else in the Middle East. In fact, every other Middle Eastern country makes homosexuality a crime punishable by death (Iran, Saudi Arabia, Sudan, United Arab Emirates, Yemen) or jail time (Gaza, Egypt, Syria, Lebanon, Kuwait, Qatar, Oman, Morocco, Algeria), or LGBTs face risks of violence, torture and “honor killings” by militias or their own families (the West Bank, Iraq, Turkey) or harassment and crackdowns from the government and non-state actors (Bahrain, Jordan). In fact, when compared to states outside the region – including most Western democracies – Israel has one of the strongest records for LGBT rights in the world. Israel’s enemies recognized how favorable this record was for Israel, and that it threatened their efforts to demonize the Jewish state. So they shrewdly maneuvered to use it against her, and link promotion of Israel’s LGBT record to the conflict in the West Bank and Gaza – even though there is none. The idea that the Israel Ministry of Foreign Affairs’ campaign is part of a diabolical scheme to cover up abuses of ‘the occupation’ is completely anti-Israel queer activists’ invention; it is their great lie. 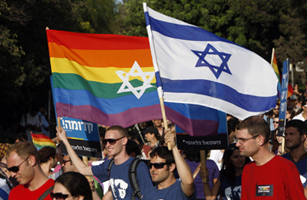 Beginning in Toronto in 2008, and later in San Francisco and New York, LGBT anti-Israel groups formed and sought to make being anti-Israel a queer value. Some of these activists are anti-Semitic – whether or not they admit it, even to themselves. The frustrating thing is that many more of them work to brand Israel an ‘apartheid state’ forall the right reasons. They are being manipulated by the combination of deceptive Palestinian leadership, biased Western media and anti-Semites into believing a counterfeit narrative where Israelis are the aggressors and Palestinians are her ultimate victims. It exploits LGBTs’ natural empathy for the oppressed. Activists who claim to not hate Israel and say they support her right to exist, yet still accuse her of brutal oppression and apartheid, are complicit in preventing a peace deal, propagating terror, and endangering Jews and the State of Israel. The sad reality is that LGBT anti-Israel groups are throwing our queer Palestinian brothers and sisters under the bus. LGBT persecution in the disputed territories is horrendous – it comes from Hamas, the Palestinian Authority, militias and even the victims’ own families. In the academic report “Nowhere to Run: Gay Palestinian Asylum Seekers in Israel,” there is testimony from Palestinian LGBTs who escaped to Israel to seek asylum status. The torture they received in the West Bank is shocking (pages 13-17). For example, one man recounts a horror story of being dragged from his home by PA officers because he was gay, then submerged in sewage water up to his neck for five hours at a time, every day for three weeks (pg. 15). The report comes from Tel Aviv University’s Public Interest Law Program, but it shouldn’t be dismissed for that reason; it’s critical of Israel for not accepting more LGBT Palestinian refugees. Once peace comes and the IDF pulls out of the West Bank, Palestinian queers will be much worse off. Palestinian LGBT testimony confirms this is what happened when the PA took over Gaza in 2005 (pg. 10). Eighty-two percent of Palestinians support making homosexuality illegal. Many more queers will die in Palestine once a state is achieved. I am not advocating for the status quo, but I do believe energy from queer anti-Israel activists would be better spent educating straight Palestinians not to kill their LGBT brothers and sisters once Israelis leave, instead of vilifying Israel. Elsewhere in the region, Iran executed three men in September, 2011 for being gay (and two in 2005). The Assad regime in Syria has now murdered over 3,000 of its own people. And Palestinians in Lebanese, Syrian, Egyptian and Jordanian refugee camps face conditions much more akin to apartheid than anything experienced within Israel (where they are citizens with the same rights as Jewish Israelis) or the disputed territories (where they are governed by the Palestinian Authority and Hamas). Yet where are the Queers Against Iranian Persecution, Queers Against Syrian Torture and Queers Against Lebanese Apartheid groups? “Palestine is a queer issue,” Israel’s LGBT critics insist. But Iranian torture and execution of LGBTs is not a queer issue? Syrian brutality against its own people is not a queer issue? Lebanese apartheid against Palestinians is not also a queer issue? Why not? Israel’s queer enemies can hurl ‘Pinkwashing!’ claims at her all they want. I, for one, celebrate the fact that the Israel’s government is proud enough of its LGBT rights record to use it for nation-branding. What would happen if the governments of Libya, Iran, Palestine and Syria bragged about their LGBT rights records, too? It would mean more LGBTs around the world would be protected and safe. Israel’s queer foes are the real pinkwashers, because they conveniently ignore the horrors committed against LGBTs throughout the Middle East in order to focus only on the Jewish state. If the term “pinkwashing” is about covering up facts to push one’s agenda, then anti-Israel queer activists are choking on their own hypocrisy and self-righteousness. are you serious? im actually asking you the preceding question. think about it. this must be a joke. you are the lowest of the low, a pseudo-intellectual, hiding your bigotry behind an irrelevant sham of an argument. i guess you love making a fool of yourself and having people laugh at you, because i cant imagine anyone bold nor stupid enough to write this. I can’t believe anyone stupid enough not to recognize the truth when he sees it, but you apparently exist so I will have to take that into consideration. The bigots and the racists inhabit the Guardian, where they fester and spew bile, and give comfort to terrorists and murderers. If anyone is the joke here, it is you. The Guardian has it’s fair share of hypocritical Gays above and below the line who are just as nasty as these Arab states that persecute them…. Here’s another racist and bigot writing in the Guardian – David Miliband – whose hypocritical views should render him unfit for office as hould his brother’s. It’s all projection. 99% of the crap that we are accused of was thought of by the anti-Israel crowd after looking at what they do themselves. And you’re proud of homosexuality in Israel? What’s next? Pride in theft and murder? Oh yeah, you’ve already got that covered. Pathetic. Thank you for this invaluable demonstration of the real characteristics of the authentic “anti-Israeli” crowd.